One of the major causes of taste and odor problems is the overuse of chlorine disinfection products. Chlorine is the most widely used disinfectant applied to potable water supplies today. One of the many questions over the use of chlorine as a disinfectant is the odor and taste that it can impart on a finished water. It is currently required by law for a certain amount of residual disinfectant as a final treatment for water before it enters the distribution system. Many utilities still use chlorine as their final disinfectant although chloramines and chlorine dioxide can also be utilized. Therefore, some utilities must use large amounts of disinfectant in order to meet the residual requirements also required in the regulations. Another source of taste and odors in water is due to excessive manganese and iron present in the finished water. These metals are often found in groundwater supplies where the overall quality of the water is good but there is a high amount of soluble metals. The metals then react with oxygen in the distribution system to produce the reduced and insoluble form of the metal. These metallic tastes can also be a result of corrosion of distribution pipes which can impart a rusty and metallic flavor. (Hoehn, 1996) Metallic taste and chlorine residual odor problems are mentioned to exemplify that there are many different causes of taste and odor issues. The third major player in the taste and odor game is the focus of the rest of the web page. A third major cause of taste and odor problems in water systems is caused by algaes, molds, and bacteria. Algae can cause negative tastes and odors when a surface water supply is used. The greatest chance for problems occur when an algal bloom occurs. A bad case of algal bloom is shown to the left. Algal blooms typically occur in the summer months due to excessive sunlight and will also occur in reservoirs or ponds when nutrient loading is high. In this case, algae are given the optimal chance to grow and under these conditions, taste and odors can often be found in the finished water. The major components within algae that cause tastes and odors are geosmin and MIB. (Buffin, 1992) Some of the characteristic smells that can result from algal blooms are earthy, musty, grassy, fishy, vegetable and cucumber. The exact smell varies depending upon what type of algae is present and its concentration. There are several ways to attack the problem of algal taste and odor. One is nutrient limitation, whereby the main nutrients, nitrogen and phosphorous levels are limited in the reservoir. Another method is the removal of the tastes and odors during treatment and a third is to control the algae through chemical applications. Shown to the left magnified 400 times, Anabaena laxa is one of the species which can cause taste and odor problems. When the mature anabaena begins to die, the individual cells break open releasing all the geosmin. This can typically occur also when the reservoir is treated by an algaecide. The predominant odors for Oscillatoria tenius are a sweet-melon-corn odor and an earthy-corn-musty odor. These odors are also associated with geosmin, as well as MIB. Oscillatoria is a filamentous cyanobacteria that reproduces by fragmentation. (Rashash, 1994) Oscillatoria is characterized by large brown rods which are not translucent. Often oscillatoria can be one of the largest types of algae present in ponds and resevoirs. The photo shown to the right is an example of Oscillatoria limosa and is magnified 400 times. Asterionella is a very minute unicellular algae, a diatom. It is commonly found in water with taste and odor problems. A picture of asterionella is shown at the right magnified 400 times. There are many other algae that produce disagreeable tastes and odors, which may or may not be produced by geosmin and/or MIB. A brief list of those alga families includes Chlamydomonas, Dinobryon, Microcystis, Phormidium, and Synura. In evaluating the raw and finished water samples for taste and odor parameters, several tests can be performed to determine the aesthetic qualities. Two of the most commonly used tests to determine if water possesses tastes or odors are the Threshold Odor Test and the Flavor Profile Analysis. Also, when considering waters potentially contaminated with algal populations it is important to analyze the source waters for its quality. This can entail running chemical tests such as pH, dissolved oxygen and nutrient loading. Testing the physical aspects of the raw water can also be beneficial. Some physical tests routinely performed include temperature, turbidity, and algal concentration.By performing the chemical tests, the most advantageous algal bloom conditions can be determined. Then, when those conditions arise, the water treatment facility can prepare for an algal bloom. The physical tests are useful because they can accurately describe the current state of the raw water. If turbidity is getting higher than normal then there could be cause for concern because algal counts could be on the rise. The tests are used in conjunction to help minimize the chances of a taste and odor problem. The threshold odor test is performed for a number of reasons. It is often used to quantify the strength of odor given by chlorine in finished drinking water, but can be applied to raw water and algal odor problems. Threshold odor testing is not an exact procedure due to the inherent variability in individual olfactory capability. The actual measurement of the odor level is called TON(Threshold Odor Number). TON is defined as the greatest dilution of sample with odor-free water yielding a definitely perceptible odor. The strength is based on a positive detection of odor and successive dilutions of a sample of water. In each sample, the volume to be used is kept constant at 200 mL. The temperatures of the samples to be tested should all be standardized, a water bath is to be used and 60o C is an accepted value for analysis. In order to be accurate, odor-free glassware with glass stoppers should be used. Also, the water used for dilution of the original sample should be similarly odor-free. The water can be prepared by passing distilled, deionized water through activated carbon. It is wise to use a panel of examiners that should be chosen based upon the importance of the test, economic limitations as well as availability of personnel. As in all tests, quality controls should be implemented for statistical significance.The successive dilutions will produce threshold odor numbers shown in the following chart. If the relative strength of the water being tested is known then prepare the dilutions according to the relative range of the odor. If it is not apparent then tests should be run using different dilutions to determine the range. Then the samples should be prepared and five different dilutions should be used. In testing, swirl the Erlenmeyer flask, remove the stopper and sniff the vapors. A positive result is any where any detectable odor is present. It should be noted that this procedure is to determine a relative strength of odor present in any given water sample. It is most effective when a panel, usually five or more, conduct the test because then the averages can be used and the statistical significance go up. Once an algal taste or odor problem has been defined, the next step is to treat the water in order to minimize its exposure. In most cases a two pronged attack is used to reduce the tastes and odors present. One involves the treatment of the actual tastes and odors, or organics, in the water. The other involves the reduction of the algal population at its source, the reservoir. 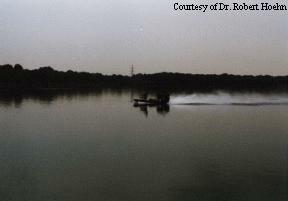 The second option is to reduce the algal population in the reservoir. The most common technique is to apply an algaecide to kill off the algae, thus lowering the organic loading and the chance of a taste or odor problem. Traditionally, the most commonly used chemical to achieve an algal reduction was copper sulfate(CuSO4). It is easy to apply, effective against planktonic and filamentous algae and is a proven technique. However, copper sulfate has its disadvantages. Among them is the fact that it reacts with the hardness of the water to form copper carbonate which is insoluble, and the fact that under high loading the possibility exists for fish to be killed due to copper toxicity. An alternative to copper sulfate is a proprietary product called cutrine plus. Cutrine plus is a chelated copper compound, which means that it does not react with hardness in water. Since its retention time after application is much greater, lower application rates may be used to have the same removal efficiency. Typically cutrine plus can produce 8-10 hours of contact time while copper sulfate sometimes may only provide 10 minutes of contact time. Cutrine plus is a liquid and therefore must be sprayed on the reservoir or pond. 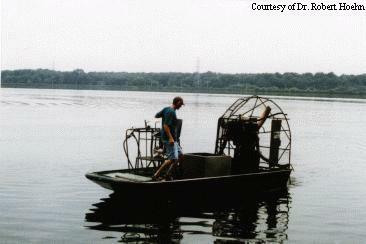 Shown below is an example of a pontoon boat used for the application of cutrine and the same boat in action on the Canoe Brook reservoir. Buffin, Lisa Webster. Treatment of Algae-Induced Tastes and Odors by Chlorine, Chlorine Dioxide and Permanganate. 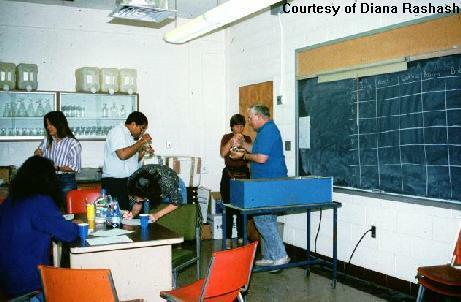 Master of Science Thesis, Virginia Tech, 1992. Everpure, Inc.,SURFACE WATER TREATMENT, H2O2.com ISSUES OF WATER QUALITY, 1997. Hoehn, Robert C., CE 4104 Water and Wastewater Treatment Design Course Notes. Spring 1996. Greenberg, A., Clesceri, L., Eaton, A.ed. Standard Methods for the Examination of Water and Wastewater. American Public Health Association: Washington, D.C., 1992. Rashash, D., Hoehn, R., Dietrich, A., Grizzard, T., Parker, B. Identification and Control of Odorous Algal Metabolites. 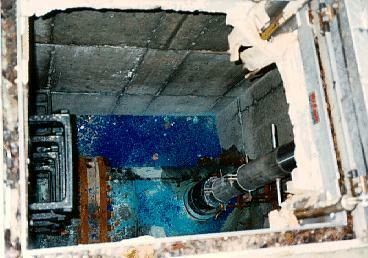 AWWA Research Foundation and American Water Works Association: 1996. Copyright © 1996, 1997 H2O2.com ISSUES OF WATER QUALITY A Publication by Everpure, Inc.